Reliance Communications owes Rs 11,460 crore ($1.78 billion) to the CDB, which accounts for around 37 per cent of the company's Rs 45,000 crore debt. As the news about China Development Bank (CBD) filling an insolvency petition against Reliance Communications with National Company Law Tribunal spread, the shares of beleaguered billionaire Anil Ambani's company fell by around 9 per cent and tanked to Rs 12.20 (BSE) and Rs 12.1 (NSE) on Tuesday. The telecom operator owes Rs 11,460 crore ($1.78 billion) to the CDB, which accounts for around 37 per cent of the company's Rs 45,000 crore debt. However, a PTI report quoted RCom spokesman saying the company had not been served any notice by China Development Bank. BSE also sought clarification from RCom after market hours on Monday but the company, reported PTI, junked the insolvency petition reports, saying "the company is engaged through the JLF (joint lenders forum) with all its lenders for a successful resolution of the SDR process. The China Development Bank has also been actively participating in the JLF." With the filling of the insolvency proceedings, all hopes of an out-of-court settlement for the company seem to be dashed. The latest blow to RCom also kills the debt structuring plan proposed by the company to its lenders. The current insolvency petition also poses the biggest challenge to RCom to even secure a minority stake in RCom. Reliance Communication had earlier offered pay Rs 27,000 crore of the total debt through asset monetisation, Rs 7,000 crore through a 'non-loan write-off' plan to lenders to convert it into equity, and Rs 6,000 by carrying forward it to new business. The recent development comes a month after the company's a merger deal with Aircel fell off. Swedish telecom equipment maker Ericsson, Manipal Technologies, and Tech Mahindra had also approached the bankruptcy court, though Tech Mahindra and RCom later decided to settle the dispute out of the court. In its application before NCLT, reported the Economic Times, the Chinese bank nominated Abhilash Lal as an independent resolution professional, with an understanding that Alvarez & Marshal (A&M) will be his advisors to take over the company. "Within a month it is expected that A&M will be in charge and then propose a resolution plan," the ET quoted a source. On November 27, Business Today had reported that telecom giant Bharti Airtel was likely to buy select spectrum and some equipment from RCom. 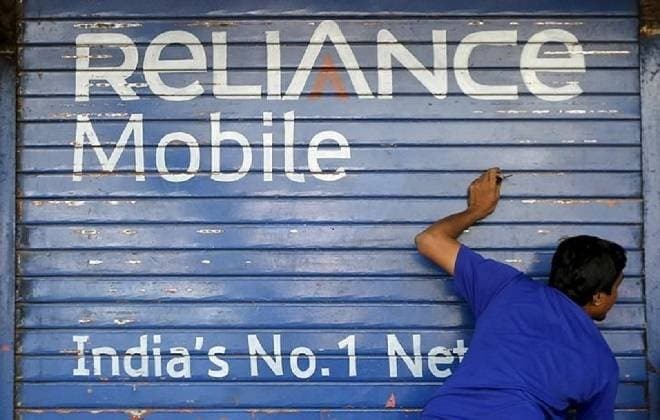 A loss-making entity with Rs 45,000 debt to pay, RCom had earlier announced to close 2G and 3G operations from November 30. The company on November 11 confirmed a quarterly loss of over $27.09 billion as compared to 620 million of profit a year earlier. In the absence of potential buyers for its businesses - wireless telecom, DTH, optic fibre - RCom had scaled down operations in the recent past. By doing so, it was trying to save on costs, and make it attractive to buyers. The company claimed by shutting down the 2G business, it would cut back on losses of about Rs 80 per subscriber per month, aggregating to some Rs 3,840 crore annually. RCom brags about its pan-India spectrum in 800/850 MHz and 1,800 MHz bands. But half of this spectrum expires in 2021. As part of its asset monetisation plans, RCom had been working on finding investors or buyers for prime real estate assets, including at Dhirubhai Ambani Knowledge City, Navi Mumbai, measuring nearly 125 acres with development rights of potentially over 17 million sq ft and prime property of 4 acre near Connaught Place, New Delhi. The company is in a standstill period (for interest and principal repayments) till December 2018 and expects to complete the SDR process as per the RBI guidelines.